Our Anniversary day greeted us with sober and drizzling weather. I could go for an additional few minutes of bicycling in the rain, making it a nice start. 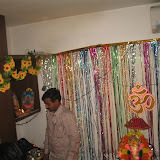 Latha has Sravana Sukravaaram (the Friday in the Telugu month of Sravana) pooja in the morning. In the evening, we headed out for a family dinner at Chutneys restaurant. As usual, we feasted on ghee and spice rich menu. 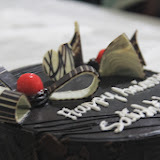 Once we are back home, its cake and fun time. Here are a few pics from the day. Some of the passions I have hardly come out during the regular course of life. May be because of my busy lifestyle or may be because I am surrounded by people who beat me in passion in those areas. One such passion for me is cooking. It hardly comes out because my wife is one of the best cooks in my life and I know I can never match her. However, my cooking skills come out once in a while, especially in my wife’s absence. One thing I realized is that I can’t cook in small quantities. I need at least 4-6 servings to be cooked for a decent result. 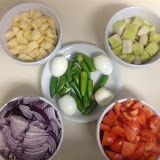 Here is a glimpse from a cooking session couple of weeks ago. This year, only myself and Surya managed to go to our native village during Sankranti. We decided to drive to that place in our Xylo. The onward journey took more than 12 hours, including a few hours of visits to relatives en-route. The drizzle hit highway reduced our speed and we fully complied with that need. Once we reached our village, it is a travel spree. I covered a bunch of backlog visits to relatives, visiting some of the places after about a decade or so. Most of these visits turned out to be reciprocal, keeping us busy throughout the festive season. The local visits lasted 400+km of driving within a 25km radius. Gathering of relatives and friends in our village turned out to be a decent success. Bunch of planning sessions, makeshift tents, food courts and other arrangements kept the guests comfortable enough. Used my Xylo to the maximum extent during the trip. Loaded it fully during some local trips, used it to transport large sized items like sugarcane and while returning, used it to carry essential items for an upcoming wedding. 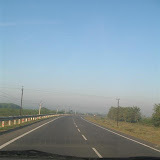 Each day of the trip followed a very simple pattern – eat a lot of spicy and non-veg food; top it up with ice creams etc. to avoid acidity; drive; meet people; eat again and repeat until end of day. During our return (which is preempted by more than a day to the last day of the festival) we found that the highway is deserted and we covered the distance in about 7 hours. The trip made me drive more than 1300km in 6 days. Some pics from the trip are linked here. 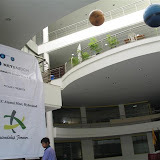 We at NetEnrich did a New Year Bash on Friday evening. 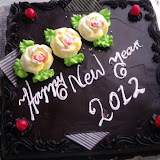 Our facilities staff, who keep the office running at all times, cut the cake and welcome the new year. Here are some of the pics from the evening. Happy New Year! RK stopped by in the morning with a cake. Evening dinner with Madhu’s family at Inorbit Mall. 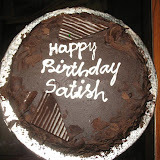 Back home and another cake. Pics from the day here. For about 2.5 decades, the concept of printers influenced my life heavily. The purpose of printing ranged from printing my “code”, results of my “code”, all the way to printing of documents and photographs. The media for printing also changed, all the way from paper to glossy photo-papers to fabric to china-ware like mugs. Give and take a few years either way, I presume your experience would be no much different. But when I saw this article, I couldn’t stop wondering. Printing 3D chocolate of one’s own design? That seems really mouth-watering. In addition to the above link, there are a couple of other food printing articles. Read here and here. Hopefully, we may soon be downloading our food “formula” and print it at home. In addition to the oven and microwave slots, kitchens of the future would have “printers.” That would be interesting.